Really Lemony Lemon Bars recipe here. 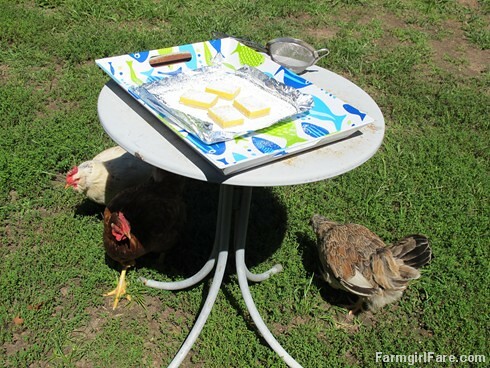 © FarmgirlFare.com, where if you bake it, they will come. I love your "The Whole Picture" posts! I find it endlessly amusing that chickens were lurking behind (beneath?) the scenes in your lemon bar post. If they're not busy being FarmGuy Joe's groupies, they're offering creative direction on your photography sessions. Is there anything those girls can't do?